Here’s a new book that you won’t want to miss! 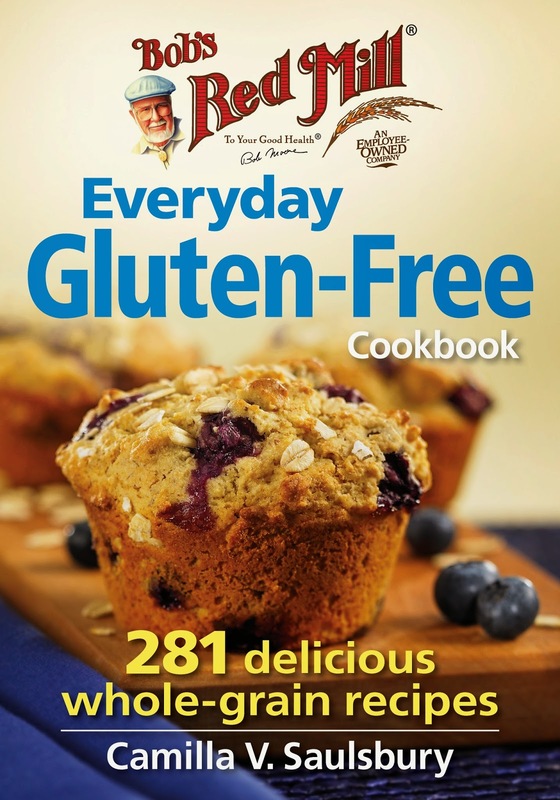 I received a complimentary review copy of Bob's Red Mill Everyday Gluten-Free Cookbook: 281 Delicious Whole-Grain Recipes by Camilla V. Saulsbury, (Robert Rose, 2015), which was just recently released. I will begin by noting that you don’t have to be a user of Bob’s Red Mill products to get a lot of use out of this cookbook. Yes, you can purchase all of the grains and other gluten-free products used in the recipes from Bob’s Red Mill, but if you avoid Bob’s Red Mill products (most likely due to tree nut allergies), you can of course use whatever brand works for you. All of the recipes in the cookbook are gluten-free. Most are dairy-free or could be adapted to be dairy-free. The baking recipes often use eggs – again, many of these could be adapted. Some recipes use nuts, but most could be made without nuts. I use cookbooks for inspiration and I found a great deal of inspiration here. What I love about the book is that the recipes don’t try to be “sugar-free” or use lots of fake stuff in place of natural sugars, but the recipes use healthy whole grains – and lots of them! Part muffin, part cereal and 100% delicious, these portable millet “cupcakes” are the new definition of fast food. 1. In a medium saucepan, bring apple juice to a boil over medium-high heat. Reduce heat to medium-low and stir in apples, millet, raisins, salt and coconut oil; cover and simmer for 5 minutes. Remove from heat and let stand for 15 minutes. 2. Meanwhile, preheat oven to 350°F (180°C). 3. 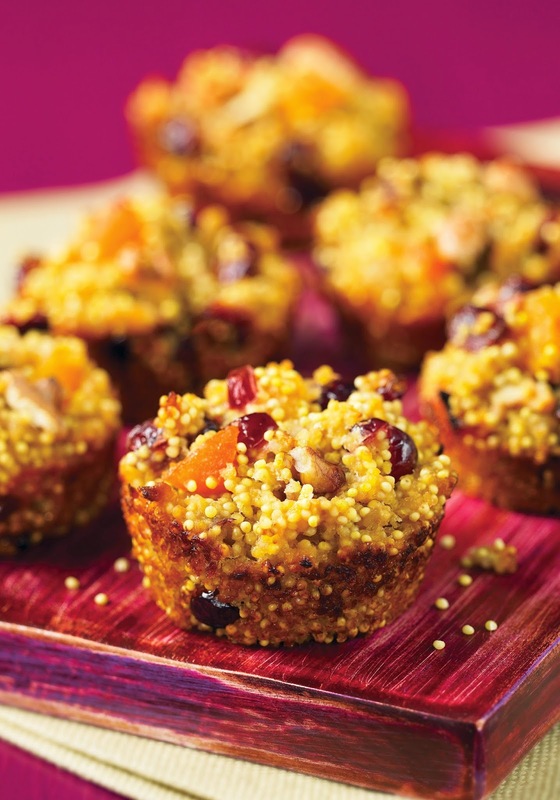 Divide millet mixture equally among prepared muffin cups. 4. Bake for 25 to 30 minutes or until tops are pale golden and slightly puffed. Let cool in pan on a wire rack for 15 minutes, then transfer to the rack to cool completely. An equal amount of olive oil or melted unsalted butter can be used in place of the coconut oil. An equal amount of amaranth or quinoa, rinsed, can be used in place of the millet. Store the cooled “cupcakes” in an airtight container in the refrigerator for up to 5 days or in the freezer for up to 3 months. Let thaw at room temperature for 1 to 2 hours before serving. Credit line: Recipe and photos courtesy of Bob’s Red Mill Everyday Gluten-Free Cookbook by Camilla V Saulsbury, 2015 © Robert Rose. Reprinted with publisher permission. A final note: I would be remiss if I didn’t note that in reviewing the book I came across some incorrect information on gluten-free product labeling laws. I have shared that with the publisher and they have assured me that future printings will be corrected. In the meantime, if you want to understand gluten-free labeling under the FALCPA, see my posts here and here. My favorite, go-to shortening for baking has long been Earth Balance Natural Shortening. This is the shortening I use for creating recipes, and I even wrote the product name into many of the recipes in Learning to Bake Allergen-Free. This product has now been renamed "Vegan Shortening," but contains the same ingredients as the previously named "Natural Shortening" and still comes in a green and pale yellow box, in stick form. The problem with Earth Balance Vegan Shortening -- for some with food allergies -- is that is contains soybean oil. (If you are allergic to soy, your doctor may or may not direct you to also avoid soy fats e.g., soybean oil and soy lecithin.) Those avoiding soybean oil must choose another option when a recipe calls for shortening. The Earth Balance product available (until recently) to meet that need was the Soy Free Buttery Spread. This product is not as stiff as shortening, making it less than optimal when a recipe really needs shortening because it gets weepy and blends too easily. If you are cutting shortening into flour (e.g., for pie crust) or creaming shortening with sugar (e.g., in the cookie recipe used here) you want to choose the most solid shortening you can (while still avoiding your allergens). 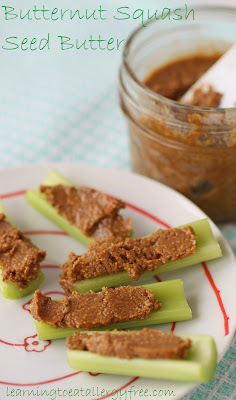 Unlike the vegan shortening, the soy-free sticks do contain some pea protein, making them a little bit softer than the vegan shortening but stronger than the soy free buttery spread. Nevertheless, I wanted to give the product a really good test as a shortening to see how it would perform. I decided to do a controlled test by making the same Chocolate Chip Oatmeal Cookies I posted a couple weeks ago, and changed just one ingredient -- I subbed the soy free buttery sticks for the vegan shortening. The cookies spread while baking (more so than when made with the vegan shortening) but not in an unruly way. The taste was virtually indistinguishable, but the texture was a bit softer. My overall assessment of this product is quite favorable. I would still choose the vegan shortening, if you can, but the soy free buttery sticks are a great second choice! I always feel like a very lucky girl when I receive new products to try, and this new flour blend from Bob's Red Mill was no exception. Until now, the Bob's Red Mill gluten-free flour blend that was available was based on bean flours (making it unique in the market). This new flour blend ditches the beans, making it similar in profile to most of the gluten-free flour blends you can find on the market. I received a free sample of Bob's Red Mill Gluten-Free 1 to 1 Baking Flour to try. Here's the scoop on the ingredients: The flour blend combines sweet white rice, brown rice, and sorghum flours with potato starch and tapioca starch. Xanthan gum is included. As with most Bob's Red Mill products, this is produced in a certified gluten-free facility. It contains no dairy or eggs, but is manufactured in a facility that also processes tree nuts and soy. While the package claims the flour can be used as a 1 for 1 replacement for wheat flour (hence the name), I would not recommend using it that way. The flour weighs 148 grams per cup, making it a full 24 grams per cup heavier than wheat flour. As always, I recommend weighing your flour (using something like this Primo Digital Kitchen Scale. Now for the real test -- how does the flour perform in baking? I made some Cherry Chocolate Chunk muffins using the recipe found here. The muffins browned nicely (something that is difficult to achieve with a rice-based blend), and the flour blend performed okay. Nevertheless, I found the flour to be on the heavy side, with a gumminess to it (and hence it won't make my top flour blends list). If you want to give it a try, I suggest sticking to muffins, cakes, or cookies.